Many would not classify Pete Seeger as an author, but a musician. Therefore, you may be surprised that his birthday is being celebrated this week on the blog. However, many would argue that labeling him a musician wouldn't be enough. He has been described in a variety of ways throughout his life including communist, patriot, activist, folk music reviver, and storyteller. Pete Seeger's contributions to the lives of children through music and stories make him a perfect candidate for a birthday celebration. - I have learned that there are many paths to success. Many of the authors that have been celebrated here have completely different approaches to writing a book. Pete Seeger shows us that you do not need to be a great illustrator or a great writer to become an author. He is a musician, storyteller, and a believer in children which lead him to publish a few children's books. - This week I learned that if songs and stories are sung and told over and over they can touch people's lives like nothing else. My family has listened to and watched the video The Foolish Frog by Pete Seeger more than any other book adapted to an alternate media. We have read the book Abiyoyo by Pete Seeger more than any other book. Music has power and when incorporated into the stories it makes them infectious. - I have learned that you shouldn't take anything for face value. Sometimes I am reluctant to celebrate an author because they initially do not seem interesting on the surface, but I am always amazed at what lies beneath. However, I was excited about researching Pete Seeger the author, this week, but surprisingly I learned a lot about a formerly misunderstood American. Lucky for our country, I can say formerly misunderstood. Pete Seeger was boycotted, terrorized, misrepresented, and blacklisted early in his career during the time of World War II. I hesitate to write to much about his political and activist history for the fear of misspeaking or misinterpreting the facts. However, it is clear that Pete Seeger was believed to be a someone who hated America, but in reality he loved his country so much that he used his voice and talent of storytelling and singing to spread his message of hope and peace. I watched the documentary Pete Seeger: The Power of Song this week. From the movie, I learned that his music group The Weavers was blacklisted from television for suspicion of Anti-American beliefs. Also, he had a goal to get the world singing so he traveled the world documenting people making music with his family. Finally, he was concerned about the health of the Hudson river and fought to save it by building a sloop. The movie was a fascinating 90 minutes on the struggles and successes of Pete Seeger's life. I walked away from the movie uplifted by the power that people united together can have in our country. I also read Pete Seeger's Storytelling Book this week. This book is over 250 pages. I usually do not have the attention span for a long book because of daily chores, playing outside with the kids, and preparing this blog. Additionally, I generally fall asleep after sitting still for 15 minutes. However, this book was written for someone like me. It is a collection of short stories. There are stories that Pete's father told him when he was a kid about talking peas and a girl growing vegetables in her hair. Others stories are based upon events in history or famous songs. Pete even shares a few of his own stories including my favorite about some lightbulbs that talk and graduate from high school! After each story there is commentary in which Pete offers additional information about the story's origin and shares tips about storytelling. Pete suggests to use funny voices and gestures when telling a story. He also suggested to not be afraid to change existing stories to make them your own. This can be accomplished by telling the story from a different point of view or changing information to reflect your situation in time and place. If the weather cooperates this week, I think a campfire is in order and I am going to try my hand at oral storytelling. Pete Seeger's Storytelling Book includes of two my favorite stories. The Foolish Frog was a story that Pete's father told him when he was younger. 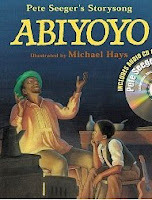 Abiyoyo was a story Pete told his children that he developed from an African lullaby. I hope you check out these stories and his music and grow to love them as much as my family does. It must be noted that Abiyoyo has a sequel called Abiyoyo Returns . In this story, Abiyoyo comes back but this time he helps the townspeople with a BIG problem. Click Here for this week's Library Checklist!